who likes to stir things up, there's going to be trouble in Texas!" 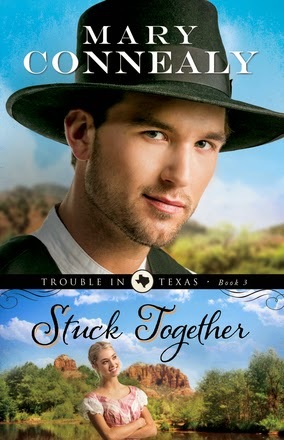 Stuck Together by Mary Connealy is Book 3 in the Trouble in Texas series. Having not read the other books in the series, I can say that Stuck Together holds its own as a stand-alone book. With a nicely paced plot and plenty of western fun, Stuck Together is an entertaining read, especially for your summer book list. The author herself describes this book as a "romantic comedy with cowboys" -- a promise of fun! Tina Cahill, determined to get the town saloon shut down, is an assertive woman who stands up for what she believes. Vince Yates, "Incredible Vince" has plenty of his own baggage, and he quickly finds that he has even more to handle than he had thought. When the two of them interact, there is plenty of humor and chemistry to entertain readers. Thinking he and Tina are "stuck together," Vince grows to realize that God was guiding them all along. This is book three of the Trouble in Texas series and the first of the series I have read. The story begins when a spunky young woman, Tina Cahill settles into town and begins picketing a local bar determined to shut it down. Vince Yates is the unpaid sheriff and has several encounters with Tina and thinks she is the prettiest woman he has ever seen. Vince has many problems of his own as his mother, who has dementia, and an unknown to him sister have come to town and are his responsibility. Vince has inferior feelings himself because of the history of dementia in the family and the stern, unfeeling father he has. He is so afraid he will become like his parents, he is afraid of a relationship. Tina proves to be good for his mother and very kind to her. After many incidents pertaining to alcohol abuse, what it does, and how people can be misleading, Tina and Vince both set out to make things right. Where will this lead for them? What part do the Indians play? What part does God play, and how does faith change attitudes? The pace of the books picks us in the second half and is hard to put down . I enjoyed it very much.